Following the outstanding success of the two posters for over four decades, and of the electronic version hosted on ExPASy for more than 20 years (1994-2016), Roche has created a new electronic version of Biochemical Pathways. This is freely accessible to everybody interested such as biochemists, graduate and undergraduate students, teachers and pupils, and allows to explore both Metabolic Pathways and Cellular and Molecular Processes. The electronic Biochemical Pathways allows the user to search the wall charts with keywords, set focus effects, activate filtering functions and zooming in on the details and elements of interest. Through a simple navigational tool, the digital version has greatly simplified the user experience and ease of navigation. To access ExPASy's ENZYME Database through the wall charts, simply use the Search function to "activate" the enzyme you are looking for. A list of all matching entries of the "Biochemical Pathways" wall chart will be given. Click on the enzyme name to navigate to the corresponding ENZYME database entry. More than 700'000 hard copies of the wall charts have been distributed to medical and life-science researchers and students around the world. 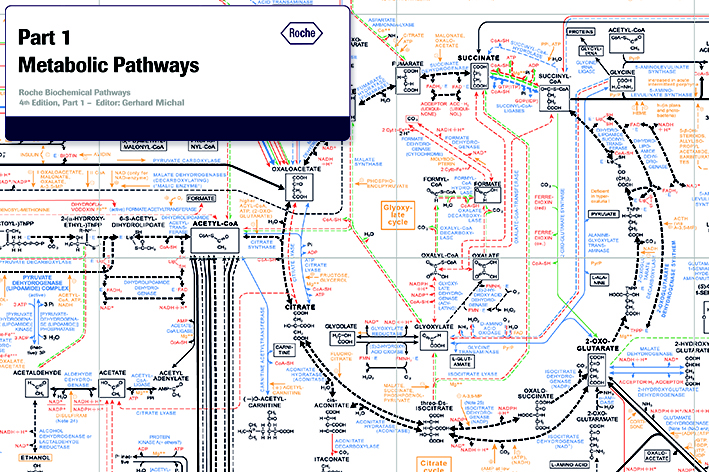 The Biochemical Pathway posters are available for download/printing : Please do NOT email ExPASy staff with enquiries on this subject.